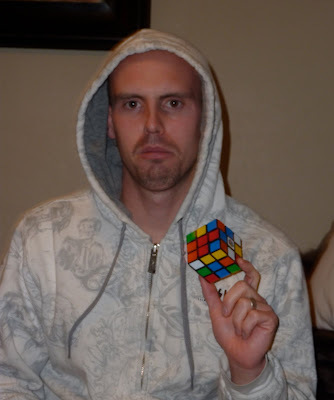 I'm not sure how you spent your holiday vacation but it was probably not mastering the rubik's cube. But never fear. That's what my husband did. Yes. 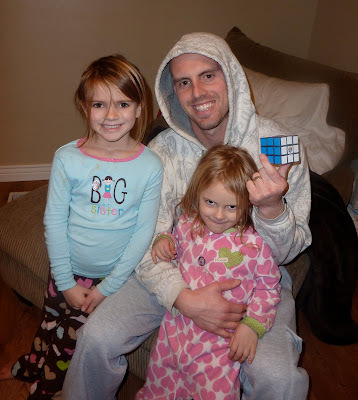 He memorized around 8 algorithms, and what was once so elusive is now child's play. He is one of "those." Now, he can pick up the cube and whip it into shape in 5 minutes flat. The first two algorithms allow you to make a single colored "cross" and complete one side and one row of the cube and dispel some of the melancholy in the face. The next two algorithms complete the second row. 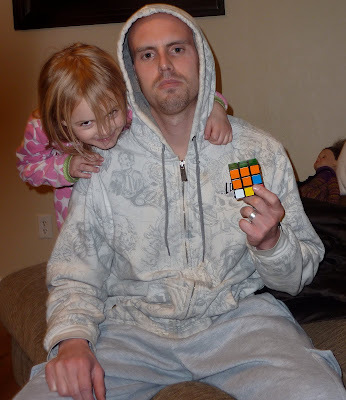 To complete the entire cube, and to get a cheery face, it requires 3-4 algorithms depending on the placement of each remaining cube. I can make it to the second row. I haven't endeavored to finish, the trickiest part by far. The amazing thing about it, is before it seemed impossible. And with a little knowledge we found it is quite simple, it just requires some memorization (I guess unless you really are one of "those" who can just look at it and intuitively solve). Hmm. A lesson to be had. so funny!! that is what traske spent most of our holiday doing!! just tonight i found it in the bathroom...i guess great minds think a like.